If you suffer from public speaking anxiety, our unique, multi-award-winning training can help ‘Tame Your Public Speaking Monkeys‘. Our trainers, Dee Clayton and Marion Hewitt, offer bespoke mentoring to individuals and teams to help improve public speaking skills, boost confidence, improve business presentations and their executive presence at team meetings, conferences, sales pitches, in the boardroom and at interviews. What are Public Speaking Monkeys, and why do I need to tame them? Public Speaking Monkeys are the negative, internal voices that put doubts in our mind about our presenting abilities. By taming them, you will overcome your fears, gain confidence, and become a cool, calm speaker who actually enjoys public speaking. Our public speaking training courses are based on our unique, multi-award-winning approach to ‘Tame Your Public Speaking Monkeys’, giving you practical tips and techniques for mastering the art of public speaking, covering things like body language and how to prepare, practise and structure your talk. Our popular presentation skills courses help business professionals learn how to ‘Tame Their Public Speaking Monkeys’ (that cause the nerves) that prevent them from speaking from the heart and portraying a professional image. Dee Clayton and Marion Hewitt offer bespoke mentoring to both individuals and teams so you will learn how to prepare a talk (within short deadlines) and what body language and voice tonality is most appropriate to your audience. Advanced presentation skills training and one to one public speaking coaching options are also available. You might be in line to give a speech, make a technical presentation, or want to feel more comfortable when pitching to clients. I’m Dee Clayton and I’ve helped hundreds of people overcome their fear of public speaking to become calm, clear and confident presenters. Being a calm, confident, and compelling speaker is about a fresh mindset and approach that enables you to communicate effectively in any future situation. From your opening line to fielding questions I will teach you how to conquer those nerves or even your innermost fears of public speaking. We provide a full range of presentation skills coaching and public speaking training near Bournemouth and are happy to work with either one person or a whole team. Whether you are within a few hour’s drive of Bournemouth or want in-house bespoke presentation skills training right in the heart of Bournemouth, we’d love to help. or contact us and we will call you back. Centrally located in St Albans, we have worked with numerous business professionals working near St Albans and in central London. Many of our clients were nervous presenters who lacked confidence, whilst other clients are frequent public speakers who are quite used to giving conference presentations to large audiences – they see the value in continuing to improve their presentation skills and their all round business communications. Our one to one public speaking coaching course is great for those who prefer learning on a one to one basis – if you suffer from public speaking fear this is the course for you. We cover how to “Tame Your Public Speaking Monkeys (those negative voices telling you “You’re Stupid and “You’re not Good Enough) to advanced presentation techniques for sales presentations and keynote speeches. So if you are ambitious and want to progress to the next level, but you know your presentation skills are stopping you from achieving more or if you are a nervous speaker please contact us so we can help you improve your public speaking now! Our management training courses help improve communications between individuals, teams and departments be they internal or external, customers or clients. Here participants can learn how to manage teams more effectively, develop their management communication skills and have an impactful presence in meetings. We often use Insights Discovery personality profiling tools and Motivational Maps in our trainings. Most training courses focus largely on skill sets, they teach “things”. But unless all the participants’ mind-sets are open they won’t implement what they know. That’s why we focus on mindset first and only then teach the skills. The result is that more participants action more of the training, meaning you get the maximum value from your investment. Our training teaches you to be confident, clear and compelling, enabling you to give better pitches, present new ideas and radiate executive presence. 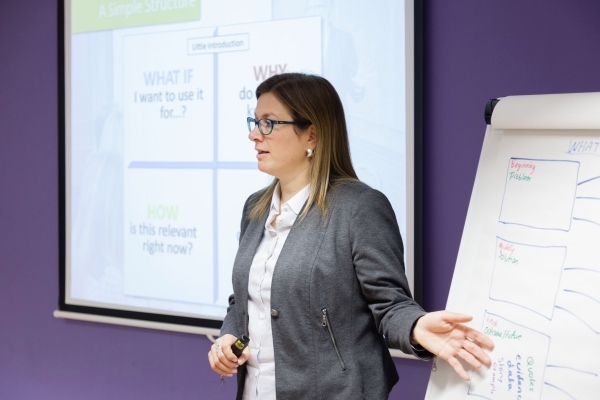 Our presentation and management courses are perfect for managers, senior managers, executives, teams and those across all industries and sectors, from Banking to Building and Marketing to Manufacturing. Anyone who attends our “Team Presentation Skills Training Course” or presentation skills mentoring with Marion may be issued with a CPD Certificate Of Attendance, which they can subsequently use with their formal CPD record for a professional body, institute or employer. "Dee felt like a part of our team from the first meeting by demonstrating an understanding of and empathy with our company culture and the business case for this training program." With our effective training courses we are proud to say we’ve won 7 business awards for our unique, innovative and effective approach to training; including being voted as “Business Person Of The Year – East Of England“ for two years running. "Participants won’t be learning how to act calm & confident – they really will be."